Clémentine Bouyé will make a presentation about “Industrial landscape on spectrometers for the pharma, food and beverage market” at the "Health Tech Event 5th Special Edition – Photonic Systems for Life Sciences Applications". This event takes place in Tyndall National Institute (Cork, Ireland) on 25 and 26 May 2016. Our Partner, Jacques Cochard, attended an Event organised by Business France from 3 to 9 April 2016 in South Korea. 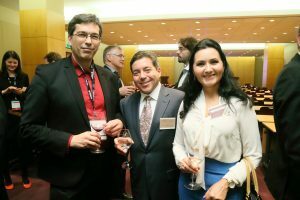 At this event, Jacques Cochard met representatives of Samsung, ETRI, and KAPID. We look forward to seeing you in San Francisco. 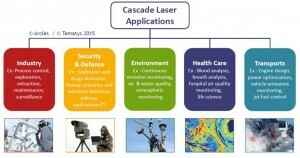 Tematys is pleased to announce the release of its new report « Cascade Laser Components & Systems: Technology and Market trends ». Our Partner, Benoit d’Humières, will attend the AFOP Event: 8-9 December 2015 in Toulouse, (France). At this event, Benoit d’Humières will meet representatives of Thales Alenia Space, LAAS, Airbus and CNES. Our Partner, Jacques Cochard, attended the EPIC Biophotonics Symposium and Exhibition: 26-27 November 2015 in Berlin, (Germany). For details about EPIC Biophotonics Symposium see here. Our Partner, Thierry Robin, will attend the conferences and exhibition of INTEROPTO 2015 in Yokohama (Japan). He will give a talk on October 15 in the « JIAL Global Technology Seminar » on behalf of EPIC. For details about InterOpto 2015 see here. For details about the « JIAL Global Technology Seminar » see here.